In many developing countries, an individual household will often engage in a range of economic sectors, such as fishing, farming, and tourism. These diverse ‘livelihood portfolios’ are thought to help to spread risk and make households more resilient to shocks in a particular sector. Whether and how local people engage in multiple occupations has important implications for how people use and manage natural resources and is of particular relevance to people involved in managing natural resources. But for scientists, donors, and policy makers, unraveling the complexity of livelihoods in developing countries has been extremely challenging. In our recent paper in PLoS ONE, we developed a novel method for exploring complex household livelihood portfolios. 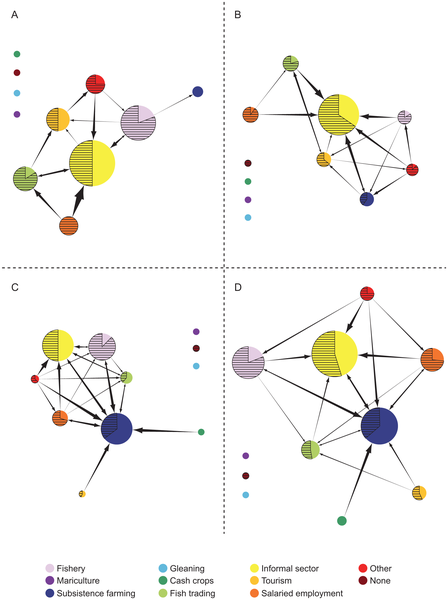 We used a network-based approach to examine how the role of natural resource-based occupations changes along spectra of socioeconomic development and population density in 27 communities across 5 western Indian Ocean countries (see Fig. 1). Figure 1. Kenyan livelihood landscape maps at various scales of social organization: a) Shela, Kenya; b) an aggregation of peri-urban sites in Kenya; c) an aggregation of rural sites in Kenya; d) all sites in Kenya. In Figure 1 the links between occupations are indicated by arrows. The size of a node indicates the relative involvement in that occupational sector (larger node means more people are involved). The direction of the arrows indicates the priority of ranking. Thus an arrow into an occupation indicates that the occupation was ranked lower than the occupation the arrow came from. The thickness of the arrows corresponds to the proportion of households being engaged in the, by themselves, higher ranked occupation that are also engaged in the lower ranked occupation. The proportion of the node that is shaded represents the proportion of people that ranked that occupation as a primary occupation. an increase in household-level specialization with development for most (but not all) occupational sectors, including fishing and farming, but that at the community-level, economies remained diversified. We also found that households in less developed communities often share a common occupation, whereas that patterns is less pronounced in more developed communities. This may have important implications for how people both perceive and solve conflicts over natural resources. Finally, our network-based approach to exploring livelihood portfolios can be utilized for many more types of analyses conducted at varying scales, ranging from small villages to states and regions. The text message from the elephant flashed across Richard Lesowapir’s screen: Kimani was heading for neighboring farms. The huge bull elephant had a long history of raiding villagers’ crops during the harvest, sometimes wiping out six months of income at a time. But this time a mobile phone card inserted in his collar sent rangers a text message. Lesowapir, an armed guard and a driver arrived in a jeep bristling with spotlights to frighten Kimani back into the Ol Pejeta conservancy. The race to save Kimani began two years ago. The Kenya Wildlife Service had already reluctantly shot five elephants from the conservancy who refused to stop crop-raiding, and Kimani was the last of the regular raiders. The Save the Elephants group wanted to see if he could break the habit. So they placed a mobile phone SIM card in Kimani’s collar, then set up a virtual “geofence” using a global positioning system that mirrored the conservatory’s boundaries. Whenever Kimani approaches the virtual fence, his collar texts rangers. They have intercepted Kimani 15 times since the project began. Once almost a nightly raider, he last went near a farmer’s field four months ago. It’s a huge relief to the small farmers who rely on their crops for food and cash for school fees. Basila Mwasu, a 31-year-old mother of two, lives a stone’s throw from the conservancy fence. She and her neighbors used to drum through the night on pots and pans in front of flaming bonfires to try to frighten the elephants away. …the experiment with Kimani has been a success, and last month another geofence was set up in another part of the country for an elephant known as Mountain Bull. Moses Litoroh, the coordinator of Kenya Wildlife Service’s elephant program, hopes the project might help resolve some of the 1,300 complaints the Service receives every year over crop raiding. More details are on Save the Elephants founded by Elephant researcher Iain Douglas-Hamilton, and this 2005 article from the BBC, and Youtube.